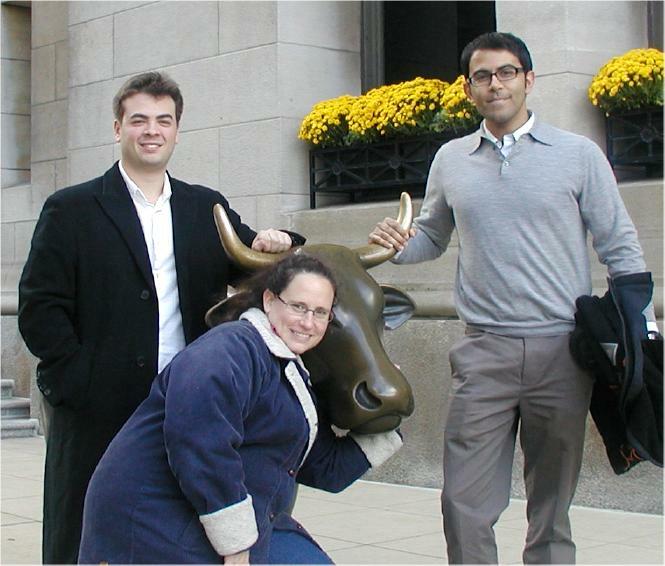 Kevin, Suzy, the stockyard mascot, and Sameer in Chicago at the 2009 Law Forum. 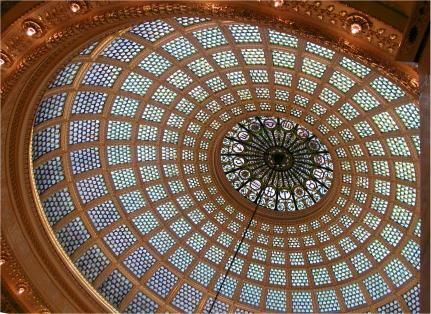 2009 was the year I discovered the Chicago Cultural Center. Kevin was my constant accomplice, serving as lookout when I got flat on my back to take this picture of the dome designed by Louis Comfort Tiffany, and helping me back to an upright position with a modicum of dignity. Kevin is also the client responsible for the start of the YouTube history links. When he told me that finding famous historical moments on the web is his hobby, I insisted that he turn them over to me! Sameer was a polite tourist, but U.S. history isn't his first love. His work took him to a field of microeconomics, financing startup loans to individuals in developing nations — the money to buy a plow or a loom, for instance — so that indigenous people, especially women, can become self-supporting. His interests dictated DC for job prospects, and Emory was as close as we could get without sacrificing educational opportunities. Kevin finished his first semester at UConn with high enough grades that we considered transfers, but the oddity of a summer moot court class kept him from having the requisite number of credits. 2013 update: we're expecting a New York Bar passage for Kevin in due time, but we're celebrating a job now. I don't want to put the name of the firm, but in this year's transparency language, it's a salaried, J.D. required job — the top of the heap. One of the best fringe benefits of working with Kevin has been the bond I formed with his Mom, Ros. We both share Ellis-Island immigrant and Little Italy roots, and have shared many a holiday memory over the years.